Izak Sanders was a photographer in Meppel. There were a number of photographers in the town in those days. Already in 1870 the portrait photographer Mr. Goldsteen settled here. At the end of the 19th and at the beginning of the 20th century he was joined by the amateur-photographer K. Spanjaard and the professionals J. Meijer, M. Bolkestein and H. Polak jr. Particularly Mr. Meijer has left an impressive body of work. About 1920 Izak Sanders settled as a photographer in Meppel. 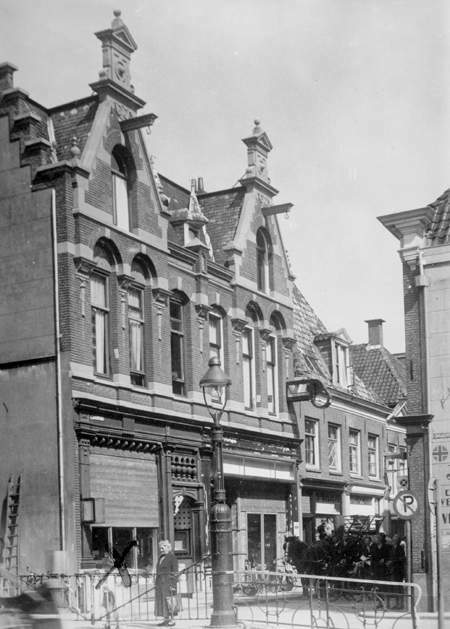 At first he lived and worked in a shop in 1st Hoofdstraat and after 1936 at 44a 2nd Hoofdstraat. He must have been poorly off, for he let a number of rooms in his house, sometimes to students. Femmigje Frank was one of those who rented a room there for some time. She caused a lot of commotion when they found her dead in her bed one morning. It was a mysterious death. Although letting some rooms provided the family with money, they must have had mixed feelings when on 24 September 1940 they received a letter from the Opbouwdienst (Construction Service) in which they were asked to provide a room for the German sergeant R. IJsenagger, who worked for this department. Ancient Geertruida Frank also lived here, before she moved to Mrs. Kan’s boarding house in Molenstraat in 1941. A photo of the Agricultural Bank taken by Izak Sanders. Not only did Izak take portraits, he also sold cameras and accessories. These he showed to potential customers in a shop-window. An important part of his work was to make blueprints for the local authorities, which he made in his workshop at home. Mr. Sanders was a moody man and not easily approachable. This may have had something to do with his handicap; he walked with a stiff leg. Izak Sanders was born in Groningen in 1878 and married there Suzanna de Groot. They had two children: Sara and Betje. Sara worked at the town hall but had to stop working when she married, already before the war, Johan van de Rhoer. He was the son of butcher Levi van de Rhoer from Woldstraat. Confectioner Bos made special kosher food for the wedding party. This was prepared in father Izak’s workshop. Betje married Albert Jacob de Vries from Leeuwarden. Life did not become easy during the German occupation. The trouble began pretty soon after the outbreak of the war. The order of 9 September 1940 made by the Secretary-general of the Department of Home Affairs prescribed that every person over sixteen had to have an identity card with a passport photograph on it. The photographers Fortuin, Vonk, Broekema and Ter Heide got instructions from mayor Wisman in which were laid down the criteria for such a photo. Izak Sanders, perhaps the best photographer of them all, was not one of them. People who had a ‘free photo voucher’ could have their passport photo made by one of the above-mentioned photographers. From the receipts of those free photos in the municipal archives appears that Izak was not allowed to take any of them. For the others it was it a very lucrative business. E.g. Mr. Ter Heide and Mr. Vonk took more than 1100 passport photos each, at the expense of the local council. Mr. Broekema took 900 and Mr. Fortuin 123. Work was made more and more difficult for Izak even in the early stage of WWII. And it would get worse. On 12 November 1941 the Department of Home Affairs sent a letter to all mayors in the Netherlands asking: ‘Are there any Jews among the ‘street photographers’ in your district?’ This question was not asked from a humanitarian point of view of course, but had serious consequences for Izak. He was one of the first businessmen in Meppel who became a victim of the measures against Jewish entrepreneurs. On the last day of the year 1941 he was forced to close his shop. Omnia as Liquidationstreuhänder did the rest. On 25 June 1943 the business was formally liquidated. Even before that the Sanders family had to leave Meppel. 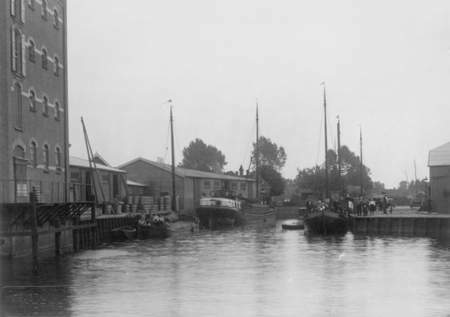 On 31 July 1942 Izak and four other men from Meppel left for work camp Vledder, where they stayed till Saturday morning 3 October. 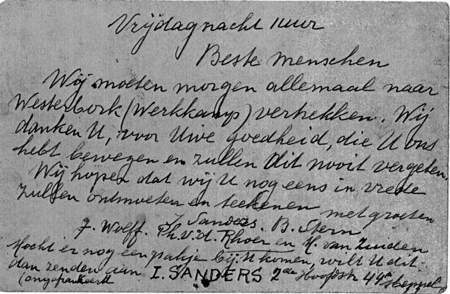 Shortly before they were taken to Westerbork Mr. Sanders wrote a moving postcard also in the name of four other men from Meppel to Mr. Heidema at Smilde, who had provided them with food and clothes during their stay in the camp. Tomorrow we will all have to go to work camp Westerbork. We thank you for all you have done for us. We will never forget your kindness. We hope we will meet again in peaceful times and send you our best regards. 44 2nd Hoofdstraat Meppel (unstamped). Postcard written by Izak Sanders in the night before he had to leave work camp Vledder to depart to Westerbork. Mr. Sanders still hoped that his wife could stay at home, but his hope proved unfounded. That very same Friday night she was expelled from her home. Like her husband she arrived in Westerbork on Saturday 3 October. They lived there together for a month. Steven van der Werf, who rented a room in their house, visited them to bring them some food and clothes. There was always the fear of being transported to Auschwitz. Every Monday they were terrified when the list of those who had to go on transport was read aloud. Would it be their turn now? On 1 November it was their turn, unfortunately: Izak and his wife Suzanna had to go on transport to Auschwitz the following day. On 2 November they departed at a very early hour together with 952 other Jews, tightly packed in some fifteen goods wagons. After three miserable days in those dirty, stinking, crowded wagons, they arrived in Auschwitz. That very same day (5 November) they were killed in one of the gas chambers in this extermination camp. Besides their own worries they were till the end in uncertainty about the fate of their two daughters. Sara died together with her husband Johan van de Rhoer in Sobibor on 23 July 1943. Betje died all alone in Auschwitz on 7 October 1944. Her husband Albert Jacob de Vries had been killed by the Germans before. Cold comfort, undoubtedly, but contrary to what is left of his contemporaries, we still have as a memory of him his beautiful photographs.